I have a long history with the Civilization series, I was first exposed to it when reading Nintendo Power magazine while they pushed the original’s Super Nintendo release for months on end. The game seemed unlike anything I had ever played before, particularly on a console. I read and re-read their strategy articles trying to wrap my head around what this game was exactly supposed to be. I never had the opportunity to play the original Civilization, but it wasn’t long until the second game fell into my lap, and there went my next few summers. The depth of Civilization II was incredible. Every game I played was challenging and had its own fun quirks. I loved the multiple paths to victory and the differences between each civilization. I really liked the early turns in each game before the game seemed to get bogged down in city management and what felt like watching all the other civs take their turn forever. After Civilization II it was Alpha Centauri, the game I believe to be the pinnacle of strategy gaming and easily the best “Civilization” game in the series. Alpha Centauri can be described simply as Civilization II in space, but it’s really so much different. You have the ability to create your own units and civilizations are instead broken up by ideological factions, which turns everything on its head. Civilization III was released and I jumped on it, but it just never felt right to me. I had invested way too much time into Civ II and Alpha Centauri and anything that deviated from those games made me angry. I gave up on III and went back to my old standbys. This might have been for the best, however, as Civilization IV was released when I was in college, and playing that might have been a disaster! 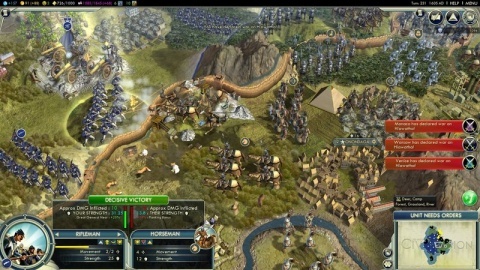 So here we are with Firaxis’ latest entry in the series, Civilization V. I’ll admit, I’m intrigued. I haven’t seriously played the series in a decade, but every time Sid Meier slaps his name on a game, I’ll at least give it a try. So let’s give it a shot, here is Civilization V’s first hour played from the free Steam 100-turn demo. 00 - I select Single Player and the first hour of Civilization V begins. The game begins loading with an introduction of Ramesses II of the Egyptian Empire. Will I be playing as the Egyptians? They get a 20% bonus towards Wonder construction and their unique unit is the War Chariot and unique building the Burial Tomb. 01 - I click Begin Your Journey and I’m tossed into the game. I just have a settler and a warrior, though each unit is made up of about ten people on the hex. I press the B key and Thebes is built. Just like Civilization II! 02 - Guess I’ll send my warrior out to explore. I can move him two moves this turn, we’re already right next to some ruins. How are there ruins already, it’s the beginning of time! 03 - Thebes is also ready to research some technology, pottery, animal husbandry, archery, and mining are available now. I’ll go with pottery. I can also have them start a construction project, how about a scout to scope out the area? Will only take five turns. 05 - On my next turn my warrior checks out the ruins and finds Old Faithful, a natural wonder. Happiness has increased by one for the entire empire. Not bad. 06 - After a few more turns I discover Ragusa, a city-state. The game tells me they’re not actually playing to win the game, just chilling out. I click on their city to see some some available actions, either give them money or a unit, or declare war. No thanks to both. 08 - My scout has been created, so now I need to pick something else to construct. I decide to go with a monument, the only non-unit I can make. My warrior discovers another city-state, Cape Town. 10 - I find another set of ruins revealing some survivors... of something. They increase Thebes’ population. 11 - We have finished researching pottery! A quote from the Bible is displayed and now I have the ability to build a granary. The UI is really well streamlined, you can just use the keyboard only if you’d like. 12 - I wander across another unit and Bismark of Germany appears! He says some stuff in German and I have a lot more options of things to do with him than with the city-states. I propose a pact of cooperation, whatever that entails, and he accepts. I’d like to trade world maps but that doesn’t seem to be an option. 13 - Oh, I need to pick another research tech, how about mining? That leads to mathematics eventually. And here’s Augustus Caesar of Rome wanting to chat. I propose a pact of cooperation... and he declines! Well, how rude. 15 - And here’s the city-state of Singapore, I sure am surrounded by them. 17 - It’s a bit disorienting at first playing a Civilization game with hexes, I kept trying to move straight up and down with the num-pad, but of course that doesn’t work. Oh oh, my scouts stumble upon some barbarians. Run away! 18 - We finish researching archery and I head down the mining pathway. 19 - The monument has been built, so I think it’s time to build another unit to properly defend Thebes. How about a new archer. 20 - I now have the ability to select a social policy, has this replaced government? My options are tradition, liberty, and honor (there are also seven other grayed out policies including piety and autocracy). Each policy requires culture to be spent, I currently have 15 culture points, enough to unlock Liberty. Let’s do it. Each policy has like its own mini talent tree to unlock more stuff, finishing five policies/trees means a cultural victory! 22 - Just found a ruin which gave me 30 culture! And the city-state of Belgrade. Each one of these I find gives me 15 gold, so it’s worth it to find them for that bonus. 24 - I decide to also unlock the Tradition policy which gives my capital a food bonus. 25 - Lord Alexander of Greece rides up on a horse as I approach Athens. He’s also not interested in a pact of cooperation. 26 - We finish researching mining so I guess I’ll finish up the original research set with animal husbandry. Walking on a mountain still unveils a larger section of the map, but takes more movement points to land on. 27 - Bismark of Germany says that Caesar is causing him some issues and would like to form a pact of secrecy. This does not declare war, what it actually does is lost on me, but why not? 29 - I decide to check out Thebes to see if there’s anything I could be doing. You can actually buy tiles around your city for your citizens to utilize. Archer is almost done too, I think I need a worker next. 31 - We finish up animal husbandry and then I start researching writing. I also garrison my archer in Thebes. 34 - My scout wanders into Singapore’s territory and now they’re angry at me, wonder if they’ll try and attack me? On the other side of the continent, my warriors approach Ragusa again and they’re defending themselves from barbarians. Maybe I can help? 35 - My spearmen take out a barbarian unit and receive five experience points. On my next turn I decide to finish off the barbarian encampment. We take some losses but receive 40 gold for our trouble. 37 - The unit was promoted, he now has some options like heal instantly or receive a terrain bonus. Is this one time or can I use them all? I heal up and that was that, no more options. 38 - Maybe I’ll have some fun and attack Ragusa, nothing else to do with a warrior. I move to attack but my advisor says you usually need four or more units to succeed as they can bombard you from a distance. Hmm... maybe I won’t attack. 40 - Okay, I guess they think we’re at war anyway and shoot at my warrior with arrows from the city! 41 - With enough culture I unlock the Honor social policy which gives me a bonus against barbarians. I also finish building my worker so I send him on his automated way. 43 - I quickly take advantage of that bonus and wipe out some barbarians, though my warriors are down to 4 hit points. 44 - I also decide to buy a plot of land around Thebes with some animals on it, I’m not doing anything else with my cash reserve. 45 - On my next turn I tell my warrior to do nothing hoping he’ll heal up a bit. My scout continues to find new city-states adding to my money. Well, he did heal up a bit, but only one hit point I believe. This time I select fortify unit until healed. 47 - Turns are going quick now that I’m only moving one unit. We discover the wheel so now we’ll try trapping. Maybe we can actually use those animals near Thebes. 48 - My economic advisor says we have lots of money and tells me to start spending it. She lists out everything we can purchase, nothing too surprising though. 49 - Yay, my settler is done! The game tells me where it recommends I build a city, sound advice if you ask me. 50 - Ha, some barbarians land right on that spot, luckily my healing warriors are very near. 51 - Ugh, the barbarians captured my settlers! Fail. That ticks me off. Now I need to build more settlers. Wait, they’ve been taken to the nearest encampment! Where’s that? 52 - Never mind, my settlers are right where they got captured! 54 - Egypt has entered a golden age, what’s the bonus? My settlers finally arrive at their destination and build Memphis. 56 - Caesar wants a pact of secrecy against Alexander. So many secrets! 57 - We finish researching trapping and now that animal hex near Thebes is ripe with food and production! Next up we research masonry. 58 - The city-state of Monaco has requested my assistance, but they are really far away. Like, hundreds of years in terms of Civilization! Well, the barbarians they need help with aren’t that far away, maybe I’ll send my warriors. 60 - Thebes finishes its second set of workers intended for Memphis, and now I tell them to work on a library. Wow, that hour went really fast! 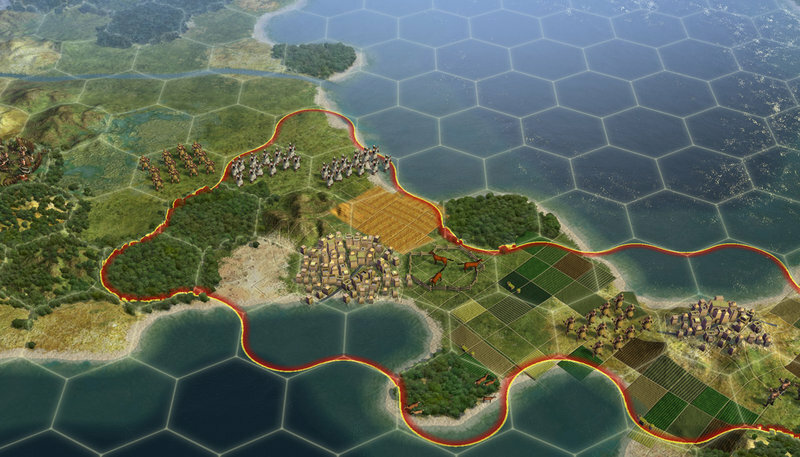 What I loved: Even though it has beautiful graphics and uses hexagons instead of squares, it still feels like Civilization. I’m a Civilization II snob but I still managed to really appreciate everything Civilization V had to offer. On my reasonably decent gaming PC, the game ran smoothly with just some weird lag after hitting the next turn button. One of the things that really bothered me about Civilization III and IV were that they seemed too focused on graphics and not enough on keeping the speed of the game at a reasonable level, Civ V has seemingly fixed that. What I liked: Graphically the game is gorgeous; keep in mind, this is just a turn-based strategy game and we got along just fine with 16-bit sprites for decades, but I can really appreciate the time and effort put into beautifying the game. From someone unfamiliar with the series, it wouldn’t be obvious to them where one tile begins and the other ends, it’s all very seamless and provides the great illusion that you’re not playing something with so much strategy and math behind it. The greatest advantage of the improved graphics is how so much information is displayed naturally on each tile. Each tile can provide many different resources and the game provides this information to you very quickly in an unobtrusive manner. This is really important for a game like Civilization where there is just so much information to take in and the delivery mechanism of such information is just as important as the data itself. So speaking of providing information, I found the user interface to be very intuitive and obvious. Menus are a necessary evil when you have to make decisions such as city and unit management, but they’re all easy to navigate and both keyboard and mouse support is available on every one. Firaxis did an excellent job boiling all the required options into simple steps, and hiding everything else away (though they’re still easy to find if you’re looking for them). City-states are one of the biggest new things I noticed and they seem to cater towards the World of Warcraft type of crowd who likes to perform quests and build up relationship experience with other groups. I felt like there were too many in my smallish game, but from what I understand you can adjust how many city-states are generated when creating a new game. I also like the new culture system that has seemingly replaced government. Culture has been around in Civilization for a while now, but it was always poorly executed, in my opinion. I like how you can build up culture points now to purchase social policies. It seems a bit more natural than simply discovering a new government system and switching between them on a whim. Would I keep playing? Definitely yes, though Civilization V is one of those games where an hour isn’t nearly enough time to really decide if it’s right for you or not. I only managed to play about 60-70 turns and I barely touched on anything. But I guess that’s the beauty of a great first hour, you peel away at a few layers and discover there is a ton more for you to explore.